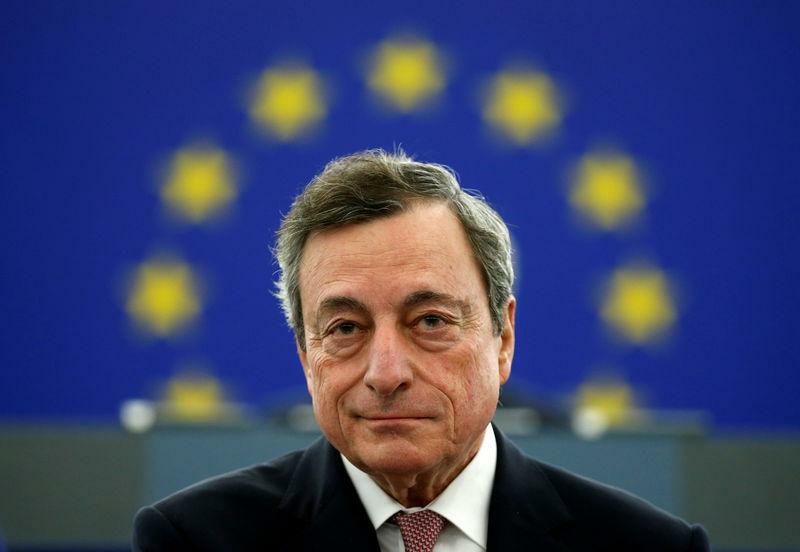 FRANKFURT (Reuters) - Some European Central Bank policymakers are reluctant to alter their guidance on interest rates as a move could tie the hands of the bank's next president many months before an appointment is even made, four sources close to the matter said. With the euro zone's economy losing steam, the ECB's long-standing guidance for a rate hike late this year is increasingly out of sync with market expectations. But policymakers have so far avoided any signal on rates beyond the term of their current boss, Mario Draghi, who is due to leave office on October 31. The hesitation implies that policymakers will first opt for other measures, such as long-term bank loans, to shore up confidence, with a move to formally push out rate hike expectations likely only if the outlook deteriorates further. "Not knowing who is the next president is very much the reason for our hesitation," one of the sources, all of whom asked not to be named, told Reuters. "Normally it wouldn't be an issue but Draghi is such a powerful personality, it becomes quite difficult to commit beyond his term." Draghi's successor is likely to be named only after the European elections in late May and the front-runners, French central bank chief Francois Villeroy de Galhau and Bundesbank president Jens Weidmann, hold very different views about policy. These differences may be key as the ECB's Governing Council has a long tradition of lining up behind its leader, with rate setters rarely challenging publicly the bank's policy stance. The powerful ECB president attends top EU-level meetings and takes a leading role in pushing for big institutional changes in the 19-country currency bloc. "But we're also pragmatic and we'll make the decision if it's necessary," another source added. "It's just that we'll have to be extra careful about signals beyond Oct. 31 until we know who is coming in." Policymakers' caution means the chance of a guidance change in March is lower if the outlook holds up, the sources said. Economists polled by Reuters before the ECB's January 24 policy meeting saw the ECB raising its deposit rate in December while money markets only price in a hike in mid-2020. Draghi acknowledged those expectations at a press conference after the meeting but said they had yet to be validated by the ECB. The Italian's assertiveness and tendency to take decisions without consulting broadly served the euro zone well at the height of its crisis in 2012, when his "whatever it takes" speech quashed speculation the single currency would collapse. But these traits may be a constraint on the bank as Draghi's term nears its end, some of the sources noted. Draghi was formally appointed four months before he took office in 2011. A similar timeline will be difficult to follow this year, however, as euro zone governments are likely to decide who gets the role during horse-trading over a package that also includes jobs heading the European Commission and EU Council. Their choice will also be subject to confirmation by the new European Parliament, to be elected in May, suggesting that Draghi's successor and the ECB will have more limited time to prepare for the handover of power.